Social networkers often find they are in breach of “rules”. Last week, for instance, players in the US Open Tennis championships were warned against using Twitter. They are not alone, the National Football League in the USA has banned the use of Twitter in some circumstances. And social networks themselves often have “unwritten rules” which can hamper your attempts to promote your business. Wherever you look on social networks it’s all “stick” and no “carrot”. We are told what we must not do and there are procedures in place for people who break these rules. Yet, there is no encouragement for doing the right thing, no support for doing well, no promotion for being brilliant at social networking. And according to newly published research on getting people to co-operate in a network, this is by far the best way to achieve positive results. The study, conducted at Harvard University, showed that in order to gain co-operation between a group of people reward was much better than punishment. Teachers have known for years that if you reward pupils they tend to learn faster and more easily than if you punish them. Equally, many businesses know that if you reward people with additional products or higher than expected levels of service, they get more loyalty than if you punish people for not buying soon enough to get the deal or not phoning at the right time, for instance. Wherever you look, reward outclasses punishment in terms of achieving success. Indeed, look at the children convicted yesterday of savage attacks on other youngsters – they were brought up on a diet of punishment and associated violence. Reward was missing entirely in their lives. It’s the same story wherever you look in terms of children with difficulties – punishment loomed much more highly in their lives than reward. And that begs the question for your business and your web site. How much of what you do online rewards your customers and potential customers? Or how focused is your entire system on “rules” and what happens if people break them? If you are too rule-bound, too punishment-focused, you could be jeopardising your business. And if you want people in social networks to help promote your business, how much reward do you provide for their help? 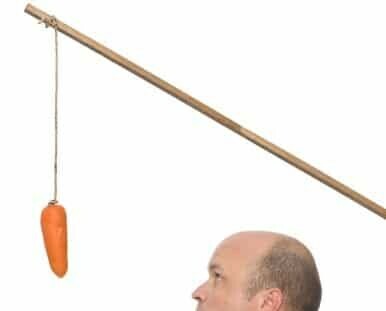 It’s carrot you need in your business, not stick.